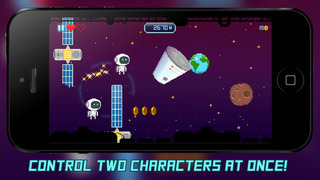 JetSpin Hustle is a retro themed, side-scrolling, adventure in space. Escape from a doomed space station by dodging and spinning your way past deadly obstacles and debris. You’ll need quick reflexes and even quicker wits to make it to the end. Do you have what it takes? Manoeuvre through increasingly difficult environments. Retro style pixel graphics and original soundtrack. Dodge and spin past deadly obstacles. Navigate your way through asteroid fields and space debris. Collect power-ups and unlock new game features. Challenge your friends through Game Center. JetSpin Hustle is FREE to download and play but some items can be purchased in game for real money. If you do not want to use this feature please disable in-app purchases.